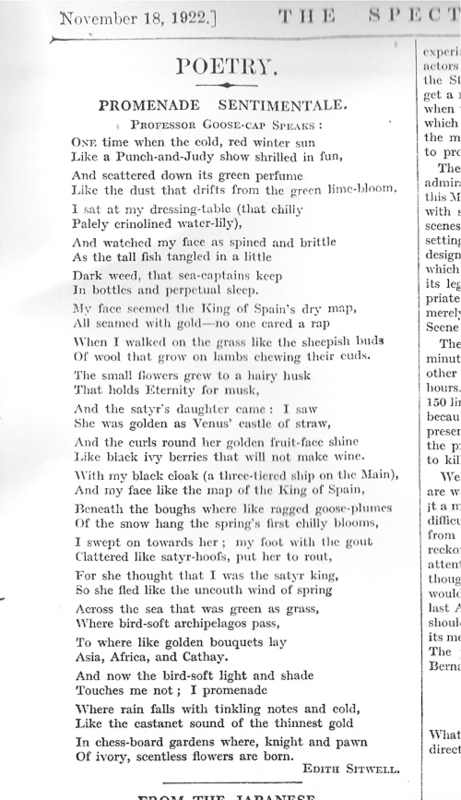 ‘Terse as virulent hermaphrodites’: middlebrow representations of modernist poets in the 1920s. A paper given at the conference on’The Popular Imagination and the Dawn of Modernism’, at the Institute of English Studies, University of London, 15 September, 2011. James had to read to her — and poetry, at that ; and not the jolly, wholesome sort of poetry the boys are turning out nowadays, either — good, honest stuff about sin and gas works and decaying corpses — but the old-fashioned kind with rhymes in it, dealing almost exclusively with love. Three years after the publication of ‛The Waste Land’, Wodehouse the popular author is assuming that his mass audience (in the Strand magazine in Britain, in the Saturday Evening Post in America) will get the joke, and realise that a new poetic style is flourishing in the post-war world, a style that is urban, grim, challenging, and ripe for mockery. How did this general audience know about modernism? Sales figures of difficult modern texts were usually not high, and as I’ll show, their appearance in mainstream magazines could arouse resistance. The large general public mostly came across modernist ideas through the mediation of mainstream writers, through reviews, cultural commentary, and – most interestingly, I think – parodies. These were usually written from a hostile viewpoint – but often in a way that made the original sound interesting. A little impalpable, but, there! I’ll translate Propertius to you as we go. During the Great War, J.B.Morton had enlisted as a private, later becoming an officer. In 1919 he had published a novel, The Barber of Putney, one of the best early attempts to encapsulate the ordinary soldier’s experience in fiction. One of the characters in that novel is a poet – O’Hanlon – an educated man fighting in the ranks, who tries hard to communicate with his fellow-soldiers, and to speak for them. That poet is the opposite of the Ezra Pound presented in this poem. Morton has picked on the pretentiousness and self-admiration that are evident in Pound’s weaker poems, and presented the modernist as totally absorbed in his own concerns, which are a long way from those of the man in the street. Is this just Philistine anti-intellectualism? 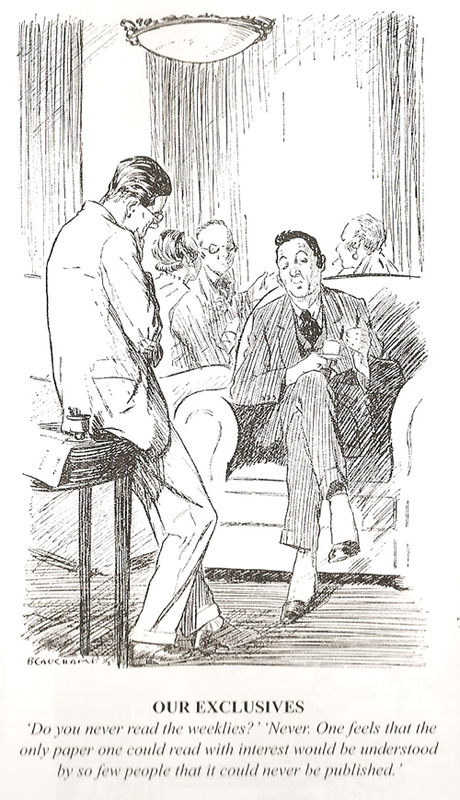 The British had probably always been suspicious of intellectuals, but in the twenties there seems a keener awareness of a new type of highbrow, whose nature is caught in this Punch cartoon. The moon’s pale leprosy sloughs the fields. Sunflowers, tall Grenadiers, ogle the roses’ short-skirted ballet. The trick seemed to be to describe nature in metaphors mostly drawn from music-halls and haberdashers’ shops, and, when at a loss, to fall to cursing. The defects of the neo-obscurantist poets may be attributed chiefly to conceit, laziness and the desire to pose. Which is, of course, being economical with the truth. 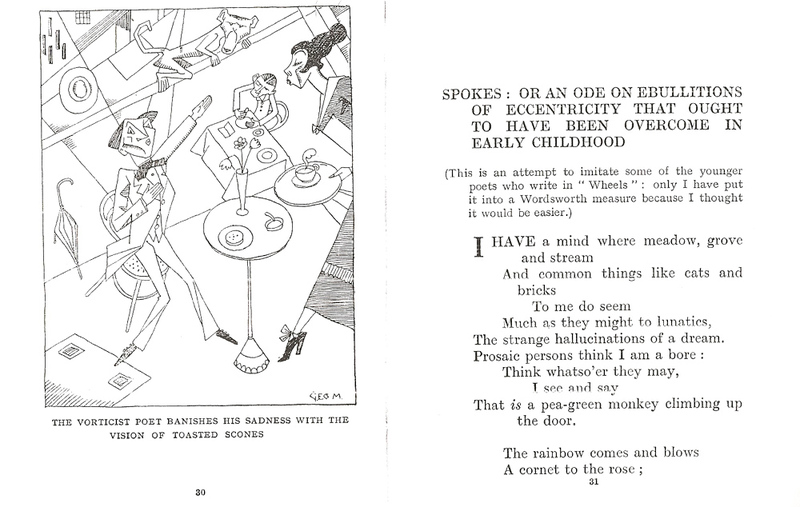 Edith Sitwell did not write spoofs, but the appeal of her poetry of the twenties is in its playfulness, its unexpected leaps, its teasing of the reader’s mind as he or she tries to make sense of it. Hers was a distinctive and deliberately strange style which was easily guyed, because her typical stylistic features, also found in many other modernist poets, include abrupt shifts of tone, unexpected juxtapositions, and an eccentric vocabulary. In Victorian and Edwardian times these tricks of style had rarely been found in the mainstream of serious poems, but were very often found in comic verse – think Lear, or Gilbert, or Carroll. The modernists were parodists too – I read somewhere that there were pastiches or parodies of thirty-seven other poets in The Waste Land, though I haven’t tried to count these myself. Modernism could even incorporate self-parody. An incident I’d like to explore at some other time is the strange affair of Wyndham Lewis’s involvement with J.C.Squire and Eddie Marsh in a parody of his own art for a charity ball. Such poems created uncertainty, to which some readers responded violently, like that Spectator reader who fumed about ‛conceit, laziness and the desire to pose’. ‛Force’, ‛dislocate’ – these are aggressive words, and whose language was being forced and dislocated? Ours. The dominant tradition of serious poetry in the years leading up to the Great War had been the Georgian one; a tradition that used traditional forms and accessible language to speak directly and comprehensibly about serious matters. This style of poetry has often been denigrated by modernists, but Merryn Williams’s very good recent anthology, shows the strength of the school, and a development through from Thomas Hardy, by way of the Georgians, to the best of the war poets. For those whose taste had been formed by this tradition, to write otherwise was perceived as an affront to common sense – ‘common’ as in the shared sense of a language that expressed common values. 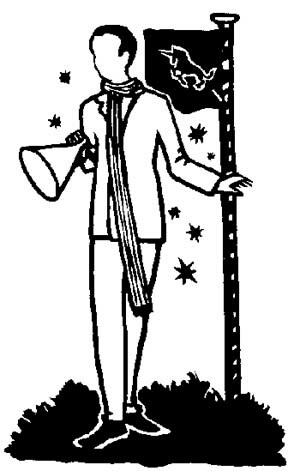 And in the twenties, one finds many examples of modern poetry used aggressively – as by Harold Acton, shouting The Waste Land through a megaphone to shock an Oxford garden party. 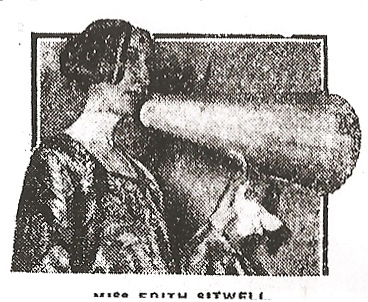 Edith Sitwell also used a megaphone on occasion as an alienating device, distancing herself from standard methods of poetry-reading. Ought to Have Been Overcome in Early Childhood’ first appeared in Punch, and then in his collection, Parodies Regained (1921). That is a pea-green monkey climbing up the door. Thoughts that not even nurse can understand. Wordsworth is appealed to, yet in this piece, Wordsworth is taken for granted; he has become part of the comfortably known, offering not the shock of the new but the comfort of familiarity. Isn’t Knox condescending to Wordsworth almost as much as to the modernists? Something similar is happening in Buchan. The viewpoint he uses to criticise Heritage’s verse is that of Dickson McCann, with his comfy anthology of traditional poetry. Parody is an odd thing. It’s very hard to write a parody of a work that you do not in part admire, or at least a part of you admires it; maybe the best parodies come when one writer has very mixed feelings about another, and uses the genre to try to sort them out. Archaic language, clunky rhythms, forced rhymes. In 1922, though, he read ‘The Waste Land’, which he dismissed as ‘a practically meaningless collection of phrases, learned allusions, quotations, slang, and scraps in general’. He wrote a parody ‘Waste Paper: A Poem Of Profound Insignificance’. Farewell, farewell, O go to hell. I don’t know what you think of that as a poem, but it does seem far far better than Lovecraft’s non-parodic pieces, which are killed stone-dead by their archaic diction so very distant from ordinary speech. Writing the parody seems to have liberated Lovecraft, and perhaps a similar thing happened to the final parodist I shall consider. Noel Coward devoted a great deal of time and effort to parodying Edith Sitwell, who was was often taken to be the representative modernist poet. She could easily be presented as elitist, wayward and socially exclusive; she also, I suspect, raised hackles by not conforming to the standard notion of a poetess – just emoting prettily. That Spectator reader accused her of ‛conceit, laziness and the desire to pose’ and, interestingly, it was not just middlebrow philistines that made such charges. These are very much the criticisms that would be made of the Sitwells by modernists of a different kind, such as Wyndham Lewis, Geoffrey Grigson and F. R. Leavis, who famously put down the Sitwells as belonging to ‛to the history of publicity rather than of poetry’. Edith Sitwell has been written out of many accounts of the history of modernist poetry. In 1923, Noel Coward was beginning to make a name for himself as a writer of songs and light comedies, but he had other ambitions. He had already written a daring play – still unproduced – The Rat Trap, a study of marital disharmony with touches of Strindberg; he was also associated with the avant-garde theatrical experimentation of the Grand Guignol season at the Little Theatre. Soon he would write the even more daring The Vortex, with its theme of drug addiction and incestuous overtones. Coward would use an attack on the Sitwells to define what sort of modernist he was. In Coward’s version, the Sitwell family became the absurdly posturing Whittlebot family. 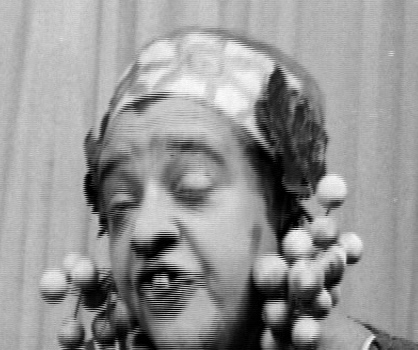 Maisie Gay played Hernia Whittlebot, an absurd travesty of Edith , with a similar taste for extravagant and eccentric dress: Coward’s stage direction insisted ‛she must be effectively and charmingly dressed in undraped dyed sacking’ with ‛a little clump of Bacchanalian fruit below each ear’. Trickle and truckle and do it again. Fade into mists of Salacious obscurity…. After too much of this, the Stage Manager tells the orchestra to strike up and drown out the poetry, whereupon Hernia Whittlebot reaches for the Sitwells’ trademark megaphone, and continues reciting until pushed off stage. It’s a sharp and effective revue sketch that turned the Sitwells into Coward’s enemies for many years. What is interesting, I think, is that Coward didn’t leave it at that. 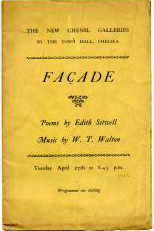 In the next year, between plays and revues, he devoted a great deal of effort into producing a slim volume of pseudo-modernist parodies – Chelsea Buns – supposedly by Hernia Whittlebot. Why? There must have been an element of sheer fun, and the scandal of having antagonised the family by the revue sketch, but in addition I think the parodies served another purpose for Coward. Calling across the sodden twisted ends of Time. Is gutted like a pratchful Unicorn. Sog, sog, sog – why is my mind ambitious? I suggest that parodying Sitwell was useful to Coward as a way of defining himself. He too was a modernist of sorts. 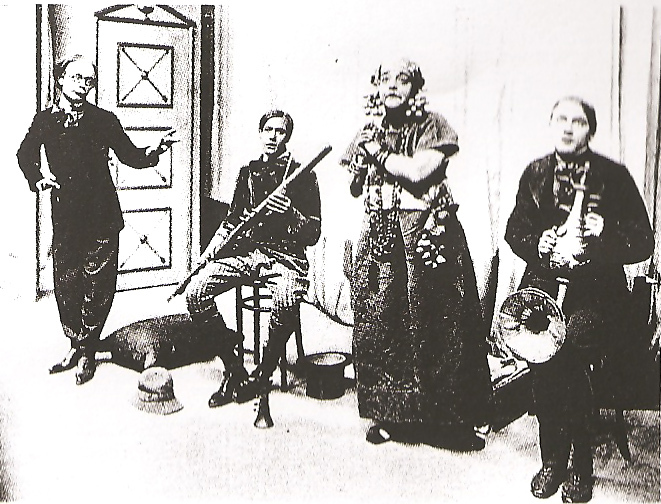 His daring play The Vortex with its incestuous overtones, was seen as very modern indeed in 1924. He lived an unconventional lifestyle and he was sexually unorthodox. Parodying the Sitwell’s kind of modernism was a way of declaring – to himself and to others – what sort of modernist he was, and what he was not. It was making links with an audience that distrusted artiness, and inviting them to trust him as an artist who would not go too far. Yet parody maybe had other uses too. 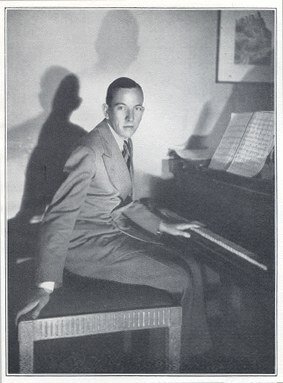 In his revue sketch, Coward had made Hernia Whittlebot prattle on about expressive rhythm – ‛Rhythm is everything. My brothers and I have been brought up on Rhythm as other children are brought up on Glaxo.’ Coward, of course, would develop a mastery of verbal rhythm in his stage dialogue, and this early poem uses verbal techniques that Coward would later employ for different purposes – the exactly phrased bathos of ‛jam’, for instance, which accentuates the pretentiousness of the polysyllables that follow. This kind of technique is also found in Facade, and for all his mockery, I suspect that Coward has learned from Sitwell. The more I look at the parodies I have discussed, the less I feel confident in a neat dividing line between modernist poets and middlebrow parodists. The fact that the parodists laid into the poems with such relish must have made the new work sound interesting, and so in a way the parodists mediated between the modernists and the larger audience. Just as cartoonists were among the first to present a sort of Cubism to the masses, even while they expressed their disapproval, parodists played their part in familiarising the general public with new directions in writing. Very interesting stuff, and fun to read! Do you have any sort of bibliography for this research? Just curious because I’m writing a paper on the reception of The Wasteland. I’ve put most of the references into the text, I think, and don’t have much of an organised bibliography on this subject. If you’re interested in the reception of The Waste Land, do you know Christopher Ricks’s 1977 75th anniversary edition of the poem, which contains a very good essay on its earliest reviews? I didn’t know it, but I’ll look it up. Thanks for the suggestion! A fascinating piece. You mention cartoon parodies of Cubism at the end. Do you have any thoughts about or can you recommend any writing on British parodies of modernist painting during the 1920s? Mere Art has become Mathematics’. Martin – sorry to have taken a time to respond, but I’ve been away. For cartoon parodies of modernistic art, see Punch at just about any time in the twentieth century – it was a standard joke. This one is a response to the more Vorticist type of war artist, I suppose. For a cartoonist who drew in a sort-of-modernist style, see Bohun Lynch, whose work appeared in many magazines, including Land and Water. 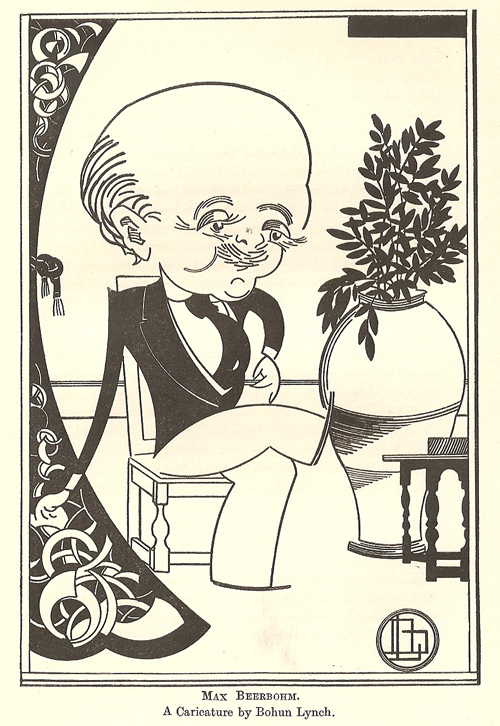 This is his caricature of Max Beerbohm, which plays some mildly cubist tricks with perspective, I think. I hadn’t registered the name of Ian Dalrymple before, but looked him up at imdb.com. He was associated with some very good films – but was he the one responsible for tacking a happy ending onto the 1938 film of South Riding? Thanks for your reply, very helpful. Going off topic somewhat, Dalrymple was indeed involved in changing ‘South Riding’s ending. I know such changes are controversial, but for an alternative perspective on this issue, have you read Thomas Leitch’s ‘Film Adaptation and its Discontents’? Another one for my reading list. I know, of course, that adaptation, rewriting and toning-down was standard practice. Authors seem to have allowed it – perhaps because they were being paid handsomely. Winifred Holtby was dead by the time the film was made, so could not complain. He friend, Vera Brittain, was offered $10,000 in 1934 for the film rights to her autobiography, ‘Testament of Youth’. She refused because, as she wrote in a letter: ‘just think what Hollywood might do.’ She was particularly concerned, I think, about how her love affair with Roland might be treated, and what his parents might think about this. They were also acceptable in cartoons as against serious art before they moved into the mainstream – Daumier, Grandville, Spy, Beerbohm himself all distorted the characters they depicted in different ways. 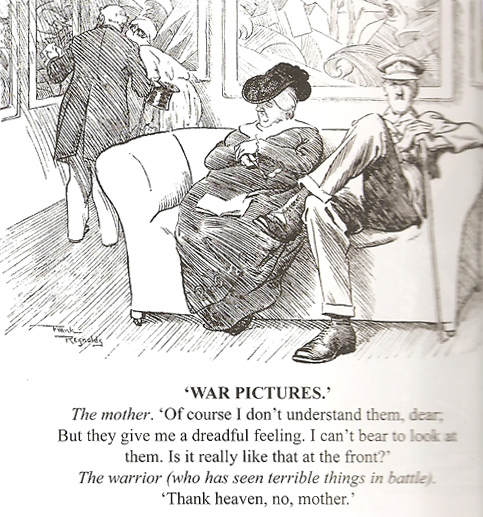 In fact, the volumes of Punch that mocked “modern art” in the 1920s onwards also had the non-realistic cartoons of Fougasse/Cyril Bird, though his distortions and stylisation probably derived from his training as an engineer. I have just found your fascinating site. I have been working on Sir John Squire for the past three years and was fascinated to read about the parody costumes he and Eddie Marsh wanted him to design. I don’t know where you found this but I would be really interested to make contact. I’m glad to hear that someone is working on Squire. There are some of his poems that I like a lot. There is an account of the ball in Paul O’Keefe’s biography of Lewis, ‘Some Sort of Genius’ (pages 141-2). That doesn’t mention Squire, though. It’s a while since I thought about this (I had hoped to write a short paper on it, but never found enough). Maybe I got hold of the Squire connection through something he wrote in the New Statesman. I’ll try to find the reference. Thank you so much for your prompt and helpful reply. I am glad you like some of JCS’s poetry. If I can help your research in any way I’d be delighted. I have, now spent a fair amount of time on him. I do have one question. In 1917 Elizabeth Asquith held a Poets’ Reading for charity. Eleven poets read: W J Turner, Drinkwater, de la Mare, Belloc, Owen Seaman, Harold Monro, Yeats, Hewlett, Binyon and Squire. Who is this? I have a guess but I would be very grateful if you gave me the benefit of your view. I promise not to besiege you with any more queries. A very interesting article. Many thanks..
What about Squire’s parody ‘If a very new poet had written ‘The Lotus Eaters’? So much for Ezra and ‘L’Art’!